Power Outage at Home – Are You Prepared? Many of us have been in a situation when the power goes out at home. Sometimes this happens during daylight hours, but it can also happen at night. In most cases power is restored within an hour or two, but in extreme cases the outage may last for several hours or even days. This can be due to storm damage (such as the extended power outages in the Washington, D.C. area recently), rolling blackouts (in place in several states throughout the U.S.) or even massive power grid failures (such as the recent failure of the SDG&E grid last year). In public areas and workplaces, laws require emergency preparedness for the safety of the public, but are you prepared at home? According to the Federal Emergency Management Agency’s disaster preparedness website ( www.ready.gov ), the following items should be a part of your basic disaster supplies kit: water, food, radio, first aid kit, whistle, dust mask, wipes, wrench, can opener, local maps, cell phones and chargers, AND flashlights. The last item is useful for emergency lighting, which you may not consider in a residential environment. If you have a disaster supply kit, these items will be easy to locate, but what if you don’t? 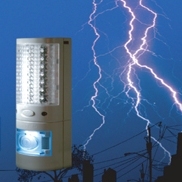 Our selection of residential emergency lighting may be just what you need! The most versatile of our residential emergency lighting is the EL-3N1 (pictured at right). This light plugs into a standard outlet to operate as a night light. During a power failure, it automatically goes into emergency mode and can remain lit for up to 8 continuous hours or 100 continuous hours if set to “Power Saving Mode.” This unit can also be removed from the outlet and operated as a flashlight. Its flat bottom and side make it easy to stand or lay on a flat surface for convenience. You can also put this fully charged light into storage or a kit for up to 2 months and still be able to use it. Besides being a great option for your disaster supplies kit, it is also a great to keep in your car, boat or RV for camping, biking, hiking or even night-time fishing! For further options on residential emergency lighting, including options for nursing homes, you can review our full selection here. You may also contact our customer service department at 877-352-3948 for assistance.